What’s the Most Affordable, Best Natural Peanut Butter? What’s the Best, Most Affordable Natural Peanut Butter? There’s little in this life that everyone agrees on. But one thing comes pretty darn close: peanut butter. Peanut butter is delicious. And if you don’t think so — I say this as affectionately as possible — you’re wrong. So when The Penny Hoarder agreed to let me taste-test several jars to find out which brand offers the most value, you can imagine my level of enthusiasm. Then they told me they were going to pay me for it. How do you like me now, everyone who asked what I’d do with that English degree? What’s the Most Affordable and Best Natural Peanut Butter? I won’t waste much time before we get to the good stuff. But since this is for science, we did follow some rules. We also opted for the “natural” stuff, which typically includes few ingredients besides peanuts and salt. Natural peanut butters are arguably healthier, and they tend to be pricier, which means there’s more money to be saved by finding the cheapest still-awesome option. In fact, a couple of brands — which you’ll notice don’t have a place on this list — rang in at well over $7 per pound. Yikes! And finally, I made sure to employ the same delivery system for each peanut butter I sampled. I puzzled over the decision for a moment: Celery sticks? Apple slices? Ritz crackers? But who am I kidding? The most palate-neutral option was also the one I was most drawn to: eating directly from the spoon. At first, I thought this weirdly small jar was a marketing trick to make a more expensive product seem cheaper. But it turned out this was actually, just barely, the least expensive of the bunch. Skippy’s “natural” peanut butter does include sugar and palm oil on its ingredients list alongside good old nuts and salt. A two-tablespoon serving holds slightly fewer calories — and a couple more grams of sugar — than the totally stripped-down versions. It comes in a plastic jar with a safety seal, which reveals a very fine layer of oil on top. It scoops well, with the oil mixing into the butter evenly and smoothly… but the flavor is unremarkable, and the texture is a little thin, somehow. This might be because of the added palm oil, which is meant to help minimize the natural oil separation that pure nut butters exhibit. For consumers used to hydrogenated products, scooping through a layer of clear liquid can seem a bit icky. But palm oil can alter the butter’s flavor and texture, even if it looks nice on your spoon. Also, this peanut butter doesn’t go bad until April 2018, which seems telling. Should “natural” PB last that long? Verdict: This pretty much tastes like dictionary-definition peanut butter, but it does feature some added sugar and oil. So although it’s relatively cheap, it might not be worth upgrading to the “natural” option. I will come clean: I’m a Smucker’s girl, through and through, and have been for years. And after tasting it next to the other butters, I felt like my prejudice is validated. The smell is definitely less sweet than Skippy, and I can see actual flecks of ground peanuts around the rim. The texture is just a little bit grainy and unabashedly savory, which makes sense since it’s got just one gram of naturally occurring sugar per serving. It tastes just like what it is: peanuts, with just a touch of salt. Verdict: As far as I’m concerned, it’s perfect… but your mileage may vary if you’re used to the sweeter, hydrogenated-oil-filled stuff. This one may be the same price as Smucker’s, but that’s about all they have in common. With an ingredients list that includes sugar, palm oil, and even molasses, it’s a wonder JIF can market the product as “natural” at all. Maybe I’m primed for it, but I smell the molasses right away when I tear off the safety seal. There’s absolutely zero oil on the surface. When I dig in my spoon, it scoops up super thick and pastey, just like the super-processed, sugar-sweetened Reese’s stuff I ate as a kid. I spit out the spoonful I took. It’s not worth eating. Especially after tasting something like Smucker’s, you can just tell this peanut butter has been adulterated. It’s thick to the point of gluey-ness, and there’s this weird, artificial-tasting sweetness that almost immediately gets lost because the mixture’s all stuck to your gums. Ick. Verdict: If you want a peanut butter that’s “natural” only by label — and doubles as cement — go ahead and purchase this one. All right, I was fooled. On closer inspection, I find the word “natural” does not appear on this jar. But it’s obviously marketed toward the same demographic, with its label’s depiction of whole peanuts and its minimalist logo. It was also in the same section on the grocery shelf. And although it seems to promise to contain nothing but, well, “simply ground” peanuts, a glance at the ingredient list says otherwise. This peanut butter includes added sugar, as well as hydrogenated cotton and/or rapeseed oils. It’s less than 2%… but still. Once again, I find none of the oil separation I expect in a natural peanut butter. I can, however, actually see flecks of peanuts suspended in what looks like the same kind of thick, fake-feeling goo I encountered with JIF. It also smells surprisingly neutral. When I taste it, it’s weird: Less sweet than JIF, for sure, but also much sweeter than Smucker’s, especially on the finish. It advertises itself as “creamy with a bit of crunch,” and I do like the tiny pieces of peanuts, even if they’re just for show. Some might criticize the product for not fully fitting into either peanut butter category — but maybe that could resolve some household arguments! Verdict: It’s certainly a stretch to call it “natural”… but maybe this is a good option if your family can’t decide between chunky and smooth? At almost double the price of the cheapest “natural” options, this had better be good. Santa Cruz’s peanut butter contains only roasted peanuts and 1% or less of salt. It’s also organic, which might have something to do with the amped-up price point. And oh man, this smells delicious when I open it. You can definitely identify that “dark roasted” aspect. The scent’s just a little bit warmer and toastier than regular peanut butter, and it’s got a layer of oil about as thick as Smucker’s has. When I taste it, there’s an almost vanilla-ish flavor; the extra roasting seems to impart a little bit of natural sweetness without adding any sugar. The oil is also slightly less pervasive than it is in Smucker’s, and the peanut pieces are slightly finer. The mixture is thick, creamy and utterly delicious, with a flavor that’s deeper and more complex than I usually expect peanut butter to be. Verdict: Since the “dark roasted” peanuts change the butter’s flavor profile, it’s maybe a little unfair to compare this one to the others — but you can tell Santa Cruz makes a fine product. 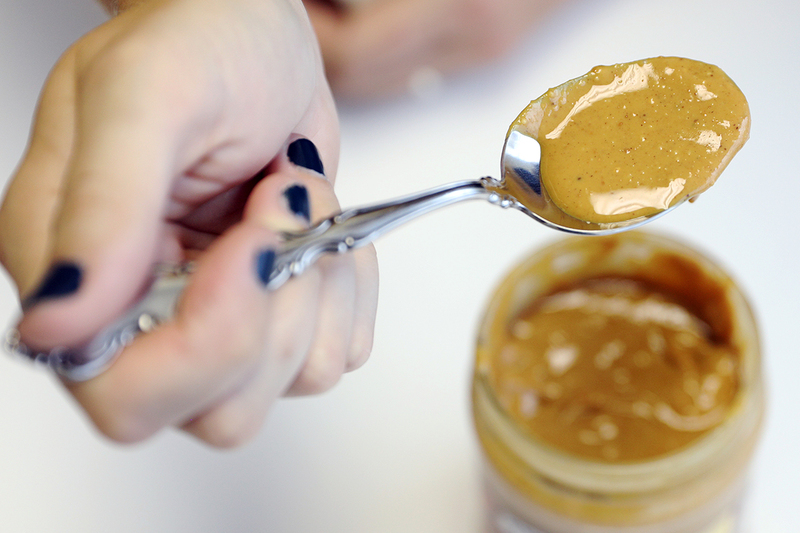 Obviously, the only person who can decide the best brand of peanut butter for you… is you. Individual tastes vary, and you may adore the same too-smooth, oil-free JIF texture I can’t stand. But for my money, Smucker’s offers a fantastic natural peanut butter option. It’s delicious, has a great oil-to-peanut ratio, and doesn’t included any added oils or sugar. In fact, the only ingredients are peanuts and salt. My second favorite peanut butter was the Santa Cruz, but again, the “dark roasted” aspect makes it a little hard to judge fairly. And although the per-ounce price is double Smucker’s, I’d hesitate to say it’s two times as good. Want More Ways to Save Money on Natural Peanut Butter? If you really want to make sure you’re eating simple, natural peanut butter, and you don’t want to go through the (delicious!) experiment of figuring out your favorite jarred brand, you could consider making your own at home. All it takes is peanuts, a food processor and maybe some honey and salt. In fact, one of the coolest parts about this option is that you have total control over what goes into your peanut butter — and, therefore, your body. You can also play with adding fun extras like cocoa powder or vanilla extract, and best of all, it’ll come out exactly as crunchy or creamy as you like. If you buy the nuts in bulk, you could stand to save a heap on your peanut butter addiction. At some vendors, you can get a whole pound of them for less than the cost of a jar — even if you splurge for pre-roasted peanuts. Obviously, though, that price is before shipping, so it’s worth checking the bulk bins at your local grocery and specialty stores. And one final peanut butter money-saving tactic? Don’t let a drop go to waste! You can stick your jar in the microwave for a few seconds to dislodge those last stubborn spoonfuls — or do like I did and just stick your darn finger (or a spatula) in the jar. After all, we Penny Hoarders do have to make sacrifices in the name of savings. I mean, just look at the torture we put our writers through. Jamie Cattanach (@jamiecattanach) is a freelance writer whose work has been featured at Ms. Magazine, BUST, Roads & Kingdoms, The Write Life, Nashville Review, Word Riot and elsewhere.